As with Damage and Silencer, I enjoyed Terrifics Vol. 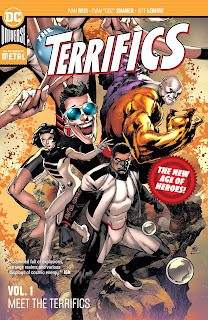 1: Meet the Terrifics more than I expected, to the point I'm wondering where "New Age of Heroes"'s first misstep will be (Curse of Brimstone is my guess, but admittedly I've only read a scant preview). Again, I think this idea of super-DCU-connected new series (so far) is really the way to go and explains why "New Age" seems to have succeeded while Young Animal did not (with Young Animal having the better claim, since objectively we need Vertigo-flavored independent-type material more than we need a glut of new superhero comics); grounding the "New Age" books in the here and now gives them the must-read immediacy that has me cracking Terrifics now while Cave Carson is still on the pile. I'd venture Brian Michael Bendis' upcoming Wonder Comics line will benefit from the same. Jeff Lemire brought us groundbreaking runs on Animal Man and Green Arrow, and he's got a lot of his own good work to live up to with Terrifics. In terms of sheer emotional depth, it doesn't quite feel like Terrifics is there yet; to a great extent it seems like Lemire is still playing some of the characters' intrinsic struggles close to the vest, and for that reason the book reads more flip than perhaps it needs in order to keep readers coming back month after month. But there's a fine amount here of smart and zany against an anything-can-happen backdrop, and that's more than enough to bring me back next time to see where Lemire is, I suspect, really going with this. For whatever reason in the vagaries of comics, this volume starts out with two issues drawn by Ivan Reis before an issue drawn by Joe Bennett, two by Doc Shaner, and another by Bennett. All of these are capable artists who depict the characters well (and having Dale Eaglesham back on Mr. Terrific next time will be a blast), though having let Shaner lead would, I think, have better signaled the character of this series. Though the new Phantom Girl's road trip back to the planet Bgtzl in the fourth chapter is strong (drawn by Shaner, with Lemire riffing pretty hard on Star Wars: A New Hope), Terrifics really comes into itself in the fifth chapter. Here, in an issue Shaner often draws with four panels per page, each depicting one member of this unlikely team, and with parallel dialogue by Lemire, Terrifics seems less Fantastic Four and more Doom Patrol, not scientists nor family but freaks of nature who only fit in with one another. Put another way, Reis and Bennett make this seem like the kind of superheroics we're supposed to take seriously, while Shaner's art deco arrival -- complete with Ben-Day dots on Mr. Terrific's mask -- reveals this as something of an affectionate send-up. It is only after Shaner's visit that Terrifics, under Bennett again, can introduce a villainous Dr. Dread straight-faced and also make fun of his name on the same page without the audience checking out, because we recognize at this point that Terrifics is more meant to operate under Silver Age rules than the sensibilities of modern times. That's also evidenced, of course, by Tom Strong and company floating around the edges, the character himself an amalgamation of modern comics and pulp sensibilities. But with no particular attachment to Strong other than interest in how these various properties blend (much in the same way I liked the Wildstorm characters joining the New 52), I'd say I didn't think Strong functioned particularly well here. Lemire didn't do enough to sell me on why Mr. Terrific was so particularly intent on rescuing Strong, especially more so than solving very immediate problems like Phantom Girl's intangibility, the mystery of who's trying to kill them all, and how to break the bond that forces the Terrifics to remain within one mile of each other. I'm eager for Lemire to actually introduce Tom Strong next time mainly again because it's clear Lemire is going for something here that I don't yet think has manifested. Quite aside from the whole mutated by dark matter thing, the Terrifics have weird lives within their own character properties. Plastic Man has been bent to many different incarnations, excuse the pun, and here Lemire takes the character's recent absence from the spotlight as a plot point, and also preserves the character's sometimes-continuity son. Metamorpho Rex Mason may be strangest of all, a character often attacked and endangered by his girlfriend's father for want of his girlfriend, as if Superman lived under Lex Luthor's roof. Lemire starts to get into this, among other things with Rex declaring his independence and resolving to leave, and this is a sensible step for the character, long-time coming, that I'm interested to see Lemire play out. In the announcement of "New Age of Heroes," there seemed some aspect of needling Marvel in Damage's similarity to the Hulk and the Terrifics' resemblance to the then-absent Fantastic Four. For Terrifics to be a Four take-off book seems not perhaps the best use of a writer like Jeff Lemire's time, but further it doesn't really seem to manifest in Terrifics Vol. 1: Meet the Terrifics; most notably the older Mr. Terrific and the teenage Phantom Girl are not Reed and Sue Richards. This is really a weird team, and if Fantastic Four did inspire at least the makeup of the team, it is inspired -- Metamorpho and Plastic Man seem obvious teammates who've never, to my recollection, teamed up before, and why we have a modern incarnation of the Legion's Phantom Girl I'm not sure but I like the additional 1970s vibe. What comics need, I've been saying recently, is unpredictability, and this is another "New Age" title offering that; I'm eager for the next.